¡Chan-ta-ta-chan! ¡Finally, I bring bread! Some of you who know about my bread-making addiction asked me to post a bread recipe on the blog. The reason why I haven't done it yet is because I wanted to find a recipe that was basic and easy but good at the same time. When I started to make bread I usually chose easy recipes with very bad results. Then I started to make harder longer recipes. I read blogs, forums and webs exclusively about bread. I bought books and read them from start to end. I made my first sourdough starter, and then the second and the third. I experimented with different types of flour, different kneading techniques, different fermentation times. Bread making is a whole world, but lets start from the beginning. Bread is basically made of flour, water, salt and yeast. These 4 elements, time, and temperature cause a series of chemical processes that transform this mixture into bread. The flour used in bread is usually flour with high protein content, called strong flour or bread flour. When mixed with water, the gluten proteins arrange themselves in a chain structure. These structures are what give bread the elasticity of its crumb. The gluten chains are achieved either by leaving the dough alone for several hours or by kneading it, which accelerates the process. Some additives, like salt, make this structure stronger. For other types of bread, bread flour is usually mixed with other types of flour (whole wheat, rye, barley, corn..) in different proportions. Yeasts are unicellular microorganisms that belong to the the fungi family. They feed from sugars and transform them into alcohol and carbon dioxide. The carbon dioxide makes the dough grow and have wholes in its crumb. Once the bread reaches a certain temperature in the oven, the yeasts die and the alcohol evaporates. That's why it's important to let the bread grow before baking. Yeast can be bought in two formats: fresh yeast and dry yeast. Fresh yeast needs to be stored in the refrigerator and only lasts about two weeks. Dry yeast has a much longer life and doesn't need refrigeration. Yeast can also be homemade. In that case it's known as sourdough starter or natural yeast. To make it, whole grain flour and water are mixed in a jar. The flour has natural yeasts from the environment, and doing this, their reproduction is encouraged. After 4 or 5 days feeding the mixture with more flour and water every 24 hours, an active culture of yeast is obtained. The starter is ready to make bread when it doubles in volume some hours after the feeding. Uff, as you can see I can start to talk about bread and never stop. And so far I only talked about the basic ingredients. 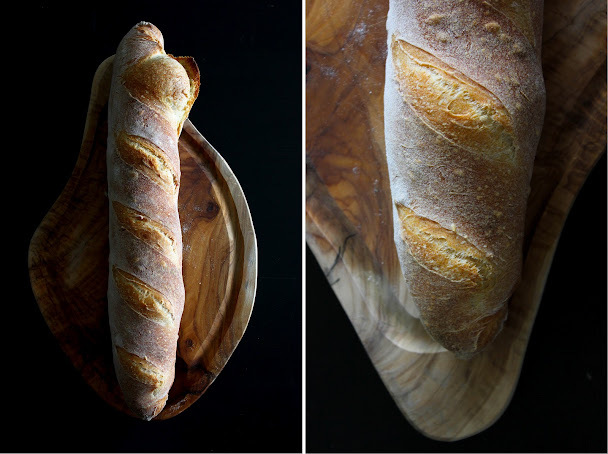 Let me tell you a little about the bread-making process and then I'll give you the recipe. Making bread consists basically in the following steps: mixing, autolysis, kneading, first rising, shaping, proofing, scoring and baking. In the mixing phase all the ingredients are mixed together. Autolysis consists on leaving the mixture stand for 15-20 minutes after mixing so the flour fully hydrates and the gluten structure starts to appear. To talk about kneading I would need a whole new post, but in general it consists of stretching and folding the dough to encourage the formation of the gluten chains. The first rising can last between an hour and some days, depending on several factors, such as the temperature and the baker's preferences. Once the dough has fermented, it would have doubled its size. Then it's time to shape it. There are so many different ways to shape bread: baguette, boule, crown, ciabatta, loaf, buns... Once shaped, the bread is left alone to proof during 1 or 2 hours or until it doubles its size again. Scoring is done right before baking and it consists of making some cuts on the bread's surface to guide the expansion of the bread in the oven and stopping it from breaking in other parts of the crust. Finally, the bread is baked in a very hot oven with steam. So that was just a very short introduction to the world of bread. 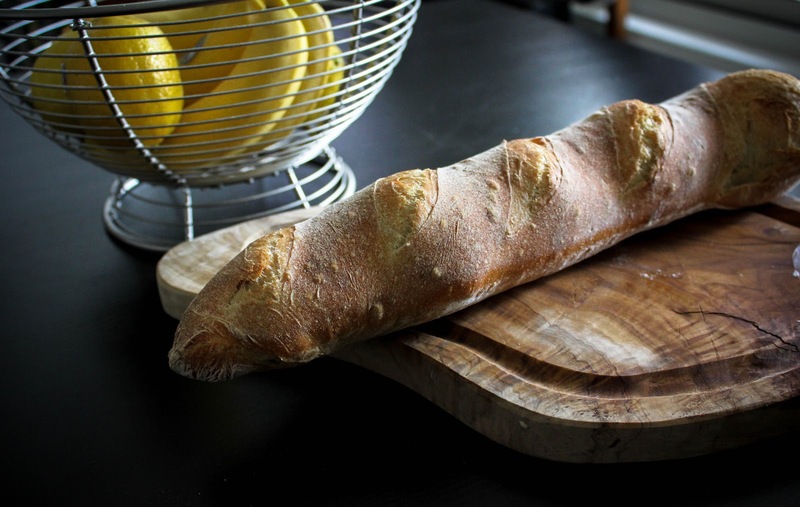 Next time I talk about bread I will tell you more things and I will post some links to sites where people know a lot more than I do, in case you are interested. But let's do this little by little. Otherwise it would be overwhelming. Today's recipe is for beginners. The only difficult thing about it is that the dough is pretty wet, which is the secret for the bread to be lighter and have bigger wholes (hey, I'm telling you secrets already). Wet doughs are much harder to handle but the results are always better. The original recipe, like most bread recipes, is made with bread flour. I wanted to try to make it with regular all purpose flour, just to see who it turned out, and it actually worked pretty well. Put the water and the yeast in a big bowl and stir well. Add the flour and the salt and mix well using a scraper, a wooden spoon or your hands, until the flour has fully incorporated. Cover with plastic wrap and let it stand for 10 minutes. Dust a clean surface with flour. Scrape the dough onto the surface. Now it's time to knead. This is the hardest part because this dough is very sticky. This video and this video show the french kneading technique, very useful for wet doughs. Knead during 8 to 10 minutes, until the dough is less sticky and very smooth. Shape the dough into a ball. Grease a medium bowl with oil, put the dough inside and cover it with plastic wrap. Let it rise for 1 to 1:30 hours, or until it has doubled its size. Scrape the dough on a lightly floured surface using a scraper or a spatula. Carefully with your fingers, extend the dough to form a rectangle. Fold the third of the rectangle that is furthest from you onto the center and seal with your fingers. Turn the dough 180 degrees. Fold the other third, that is now furthest from you, over the center and seal with your fingers. Fold the furthest half of the dough over the closest half and seal with your hands. Put the dough so the seam side is down and using your hands roll it back and forth to stretch it to the sides, starting in the center and slowly moving your hands to the sides. This is much easier to understand if you watch this video and this video. Put the bread over a baking sheet lined with floured parchment paper. Cover with a kitchen towel and let it stand for 1 hour. After 30 minutes, preheat the oven to 475°F/ 250°C and put a metal baking pan in the bottom of the oven. After the loaf has doubled its volume, score it making diagonal cuts using a very sharp knife or a razor blade. This video has a great explanation about how to do it. Pour a cup of water over the preheated baking pan and put the baking sheet with the bread in the center of the oven. After 15 minutes, remove the water pan and lower the temperature to 400°F / 200°C. If the bread is baking unevenly, rotate it 180 degrees. Bake for 15 more minutes or until golden brown. Let it cool on a wire rack. 1. If you have a baking stone, put it in the center of the oven before the preheating step. When transferring the dough to the oven, do it sliding the parchment paper onto the stone so the bread doesn't loose its shape. 2. This bread is exquisite when it's still warm and some hours after baking, but it's not so great the day after. Because it has commercial yeast and no preservatives it doesn't last long. 3. Do not try to shorten the rising times. Patience is the most important thing when making bread. In general, making bread requires little active time but long waiting times and it's extremely important to wait. The pimple that my baguette had was due to not letting it proof enough. 4. You can use fresh yeast instead of dry yeast using twice the weight as when using dry yeast. In this case, you would need 4-5 grams. Add the fresh yeast to the water crumbling it with your fingers. The rest of the process remains the same. © SPOONGLISH 2012. Powered by Blogger.